Choose the best value for your Junior Golfer. Have you joined the Premium Players Club? Discounts on Tournaments that could save you $240 per year. Play 3 Events per year and your membership is covered. Birdie and Eagle Members should download the JC Golf Junior App and submit to Marcia for processing at marcia@ncjga.com when complete. 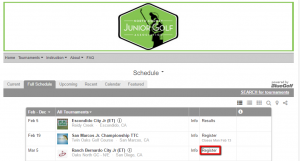 * Instructions and a form to process your JC Golf Junior Card will be emailed after check out on the NCJGA site, please allow for 5-7 days to process. Become a Member Now To Start Saving & Register for Tournaments Later. Register now and sign up for tournaments later. Register when you sign up for your first tournament (next section). If you were an NCJGA member from a prior year, you should sign with your existing member account. Register for a Tournament Now & Become A Member At The Same Time. Click Info for fees and details, or Register (shown below) to sign up as a Member or Non-Member. If you are new, select I am not a member. Then, after reading our Waiver and entering your Contact Information, you will get the Tournament Registration screen. 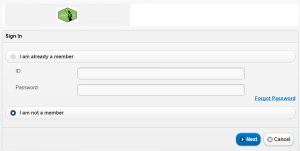 The default (and best) choice is Membership Registration. However, you can select No Thanks to sign up as a Non-Member. On the next screen (shown below) you select the appropriate Event Fee. Choose the fee that matches your membership status when you register for a tournament. The NCJGA support team manually verifies each registration for accuracy.